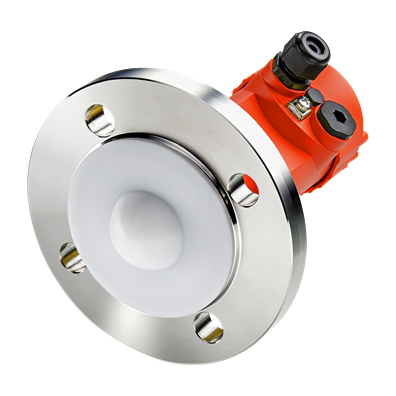 Processing operations facing challenging conditions measuring liquid levels in storage tanks will welcome this new 80 GHz non-contact radar level sensor. Measuring distances up to 98 feet, the BinMaster NCR-84 80 GHz radar is designed specifically for reliable measurement in demanding liquid conditions including excessive steam, vapor, condensation, or surface foam. The signal is focused in a very narrow beam angle, allowing for precise aiming to avoid obstructions in the tank such as agitators, mixers, fittings, or heating coils. The NCR-84 is also appropriate for use in tanks with turbulent product surfaces, viscous media, and slurries. This sensor is offered in threaded, flange and hygienic versions for a wide variety of industries and applications, plus a plastic antenna option for use in low pressure or temperature ranges. The threaded 1-1/2” version mounts conveniently in existing small process fittings without the expense of costly mounting modifications. An optional ¾” NPT process fitting makes it easy to mount in small tanks and space-constrained areas, while its compact design makes reliable measurement possible in small tanks. Hygienic and 3A fittings are available for use in food and pharmaceutical applications where sanitary standards apply. Data from the NCR-84 can be sent to the BinView web application or Binventory software for live data monitoring from a smartphone, tablet, or PC. For real-time data access in the plant near the tanks, the DPM-100 digital panel meter can display readings in gallons, headspace or level for multiple tanks. This liquid level sensor offers plant-friendly operation and is compatible within a network of many types of sensors. Setup and diagnostics can be done in minutes using the BinDisc module under the unit lid. The NCR-84 is simple to configure and commission, even in complex vessels. Plus, its encapsulated PFTE antenna is resistant to buildup and is maintenance free.